The Certify-Able Data Professional: Reviewers Needed for DAMA Dictionary version 2.0! Reviewers Needed for DAMA Dictionary version 2.0! 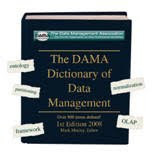 DAMA members interested in providing comments on the next version of the DAMA Dictionary of Data Management can sign up to be a volunteer reviewer here. Upon acceptance, you will be emailed with an invitation and link to the wiki site where the dictionary terms are posted. If you don't have a Google account, you will be asked to create one at that time so that you can participate in the the online collaboration. PlEASE NOTE: The period for open review and comment ends on 1/16/11!